Gee, I am such a sucker for a house building saga; House by Tracey Kidder, and Woodsman by Anne LaBastille are early favorites. desire to build something from the ground up intrigues me. A great gift for many on your list! Confronted with the disappointments and knockdowns that can come in middle age—job loss, the death of his mother, a health scare, a divorce—Lou Ureneck needed a project that would engage the better part of him and put him back in life's good graces. City-bound for a decade, Lou decided he needed to build a simple post-and-beam cabin in the woods. He bought five acres in the hills of western Maine and asked his younger brother, Paul, to help him. Twenty years earlier the brothers had built a house together. Now Lou saw working with Paul as a way to reconnect with their shared history and to rediscover his truest self. As the brothers—with the help of Paul's sons—undertake the challenging construction, nothing seems to go according to plan. 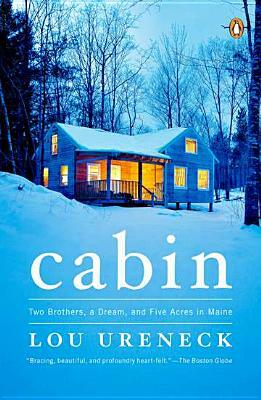 But as they raise the cabin, Ureneck eloquently reveals his own evolving insights into the richness and complexity of family relationships, the healing power of nature, and the need to root oneself in a place one can call home. With its exploration of the satisfaction of building and of physical labor, Cabin will also appeal to readers of Robert Pirsig's Zen and the Art of Motorcycle Maintenance, Matthew Crawford's Shop Class as Soulcraft, and Tracy Kidder's House. Lou Ureneck is a journalism professor at Boston University and a former newspaper editor at the Portland Press Herald in Maine and the Philadelphia Inquirer. His first book, Backcast: Fatherhood, Fly-fishing, and a River Journey Through the Heart of Alaska, received the 2007 National Outdoor Book Award. He lives in Boston and near Bethel, Maine.